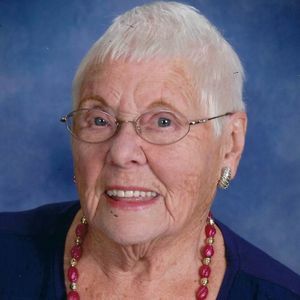 Bernice 'Bea' E. Breitkreutz, age 97, of Horicon passed away on Tuesday, March 26, 2019 at Angel's Grace Hospice in Oconomowoc. A funeral service for Bea will take place on Friday, March 29, 2019 at 12 noon at St. Stephen Lutheran Church in Horicon with the Rev. Jonathan Szczesny officiating. Visitation will take place from 10 a.m. until the time of the service at 12 noon at the church in Horicon. Burial will take place at the Hustisford Cemetery following the funeral. Bea was born the daughter of Emil and Edna (Pahl) Kirchoff on June 28, 1921 in Dodge County. She had worked at various canning factories in the Dodge County area, as well as, Marlin Toy Products in Horicon. She was also an ambitious cleaning lady for various households and churches. Bea was most importantly a soft and good hearted grandmother for her 5 grandchildren that she helped take care of. In her spare time she enjoyed taking care of her plants, watching and feeding the birds, and going out for dinner with her family. Family was most important to Bea and she cherished the time especially spent with her grandchildren and great grandchildren. She was a member at St. Stephen Lutheran Church in Horicon. She is survived by her children- Sheila (Clay) Falkenthal of Hustisford and Timothy Breitkreutz of Horicon. Her grandchildren- Abby (Sam) Schroeder, Ashley (Justin) Bestor, Adam (fiancé Amanda Blaisdell) Falkenthal, Austin Falkenthal, and Brandon (special friend Candis Zills) Breitkreutz. Her 4 great grandchildren- Sullivan, Hadley, Camille, and Drew. Further survived by nephews, other relatives, and friends. Bea was preceded in death by her parents, sisters Alvira Heller, Anita Breitkreutz, Leora Kirchoff, Marjorie Jane Melbrecht, brothers Raymond and Oscar Kirchoff. Memorials may be directed to St. Stephen Lutheran Church in Horicon or Angels Grace Hospice in Oconomowoc. Add your thoughts, prayers or a condolence to Bernice 'Bea''s guestbook.